TERRY HOPE ROMERO IS A MULTI-MEDIA MAVEN, who has been cutting into the mainstream with her unique style of vegan cuisine for years. I will never forget how back in 2010, when I was art directing an issue of the very mainstream and very popular women’s magazine Latina, the editors chose to open the entire Food section with a profile on Terry and one of her recipes. The pull quote from they selected from her read, “Latin food has heart, soul and sabor. And vegan food is friendly to your body and the planet, and compassionate towards animals. Philosophically, the two are a great match.” I was floored. Juggling multiple media outlets is nothing new to Terry. In 2003, she co-hosted the lively DIY-style cooking show Post Punk Kitchen with her vegan partner-in-crime Isa Chandra Moskowitz. The 6-episode show led to the now-hugely popular site, and a vibrant cook book co-authoring career between the two women— long-time friends since their punk scene days. Some of their biggest hits include the vegan cooking bible Veganomicon and the baking must-have Vegan Cupcakes Take Over the World. 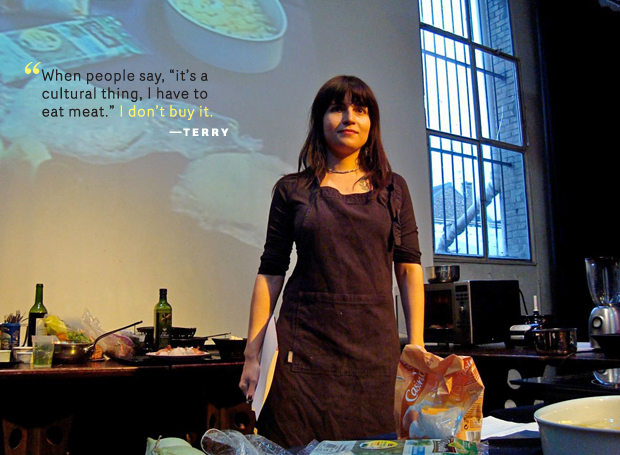 In 2010, Terry released her own book, Viva Vegan!, arguably changing the landscape of Latin cooking. Refreshingly humble and reluctant to toot her own horn, she did admit to me when I spoke to her recently that she gets letters from readers like, “Thank you for doing this, I miss eating this food” and “I’m going to give this to my Mom, so she can make healthier choices.” Her latest book Vegan Eats World deliciously answered the question, What if the world was vegan? with countless globally-inspired recipes. 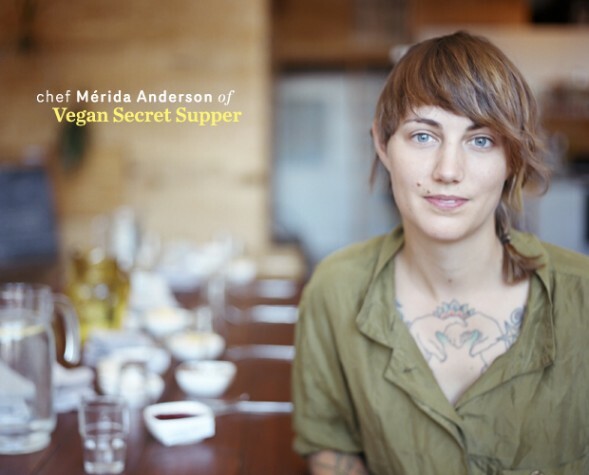 (If you’re in New York, be sure to catch her on May 15 at The James Beard House, reading from this very book). And as if all this wasn’t impactful enough, she has also been on your television— co-starring in the first season of Vegan Mashup, along with vegan chef stars Toni Fiore and Miyoko Schinner, airing weekly on the Create public television channel. I spoke to Terry on the eve of the show’s season finale (tune in May 8th at 8:30am and 2:30pm), and she was kind enough to share one of her recipes. 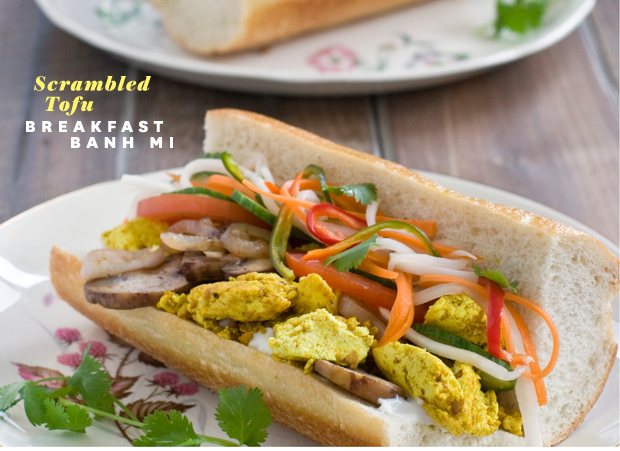 This hearty bahn mi filling of golden scrambled tofu packed in a toasted baguette is too good to eat only for breakfasts, eat them up for casual weeknight meals too. You could always just use carrot and cilantro for garnish, but for really amazing sandwiches make the Daikon and Carrot Star Anise pickles! 1. Heat a wok or cast iron skillet until nearly smoking, then sauté mushrooms with 1 tablespoon of oil until tender and browned, about 4 to 6 minutes. Remove from wok, wipe down the surface and add remaining oil. Add the shallots and stir-fry until golden, about 4 minutes, then add white parts of scallion and garlic and stir fry for 1 minute. Crumble in tofu, add the mushrooms and stir-fry for 2 minutes. Whisk together vegetable broth, soy sauce, lime juice, coriander, white pepper, and curry powder and pour over tofu. Use a large wooden spoon or rubber spatula to stir fry tofu until all of the liquid has been absorbed and tofu is golden, about 8 to 10 minutes. Tofu should be moist, but not wet. Add the green tops of the scallions, fry for another minute and remove from the heat. 2. Slice rolls in half and toast if desired. Spread insides with mayo and distribute the tofu evenly on the sandwiches. Top each sandwich with cilantro, tomato, radish, chili sauce, and daikon pickles if using. Eat immediately but over a plate…these are messy goodness. Huge congrats on the show! Is it important that people, particularly vegans, know how to cook? Thank you! Absolutely. Vegan food has changed tremendously over the past twenty years. It’s escaping some of the stereotypes of it not being creative, or it being boring, or that it’s limited. I keep talking about the need to cook. Americans probably cook way less than people do in other parts of the world. Showing that vegan food can be made at home that is fun, easy, delicious and interesting for everybody— is very important. And that’s why a show like this is so relevant. People love to see shows about food. That’s what’s super current about [Vegan Mashup]. People want to see food and how it’s made and how it’s done. So that’s just sort of the approach of the show. It is still very grassroots. This is not some giant TV cable station or network type craziness. This is really about people kind of doing it for themselves. Which definitely makes cooking feel less intimidating! You’re known for hardly using any vegan meats or cheeses in your recipes and focusing on whole foods. That said, can you share any recent products discoveries that have gotten you excited? Oh there’s this cheese made in Switzerland called Vegusto. It’s the best vegan cheese product I’ve had anywhere. It’s incredible because it stinks. I miss stinky cheese! This stuff is very flavorful, very tangy, very smelly. And you can only get it in some parts of Europe. And I brought back a bunch of it back. I’m going to make some grilled cheese, it’ll be fun. But when it comes to writing recipes and publishing cookbooks, I don’t tell people to buy products like that. Even in my baking books, I don’t use egg replacer. It could be bananas or it could be tapioca flour. It’s all circumstantial with what kind of flavor you’re trying to make. I emphasize natural foods. I always tell people, especially more over the years— you could have made this food with stuff you find in the supermarket. You don’t have to go out and buy some exotic weird ingredient, unless you’re doing international cooking. [And if you are], then learn how to use lemon grass, it’s not about buying a certain kind of vegan mayonnaise. Of course, those products can be great in drawing people in who normally don’t eat vegan foods. They certainly have a place, and I’m even doing some product development. I’ve been approached by a tofu company to develop recipes for the Latin-American market. Exciting! Speaking of the Latin-American market, your cooking is definitely helping to shift paradigms. What has been the response from the Latin community? That’s amazing, and definitely highlights that cooking can in fact be a form of advocacy and activism. We actually just talked to a few activists about working hard and avoiding burnout. What’s your take on that? It’s really important to try to find balance and do things that actually make you happy, that don’t necessarily feel like a big obligation in your life. That’s where I see people burn out and go crazy—when they don’t leave space in their life that’s purely enjoyable or pleasurable. I have a lot of hobbies in addition to cooking and vegan stuff. I’m really immersed in geek culture. I play a lot of video games, I go to game conventions, I read comic books. Stuff like that. Which is a separate world from “I’m gonna do vegan stuff all the time and just hang out with vegans.” You need to diversify your life. Another thing that I see when people burn out is that they isolate themselves somehow. It’s important to stay connected with other people: your family, your friends, whoever. Just make sure that you are connected to other human beings in your daily and weekly activities. So cooking is not only your livelihood, but is also a profound source of joy and well-being for you. When did you know you loved cooking? Really early. I think I was cooking since I was eleven, twelve years old. Maybe even before that. I found food interesting. I loved reading cookbooks, I loved reading cooking magazines, and my parents let me play around. I think a lot of kids, when you give them the opportunity— really love cooking. They love seeing the textures of vegetables and fruits. When they get a little older, a lot of kids love to bake. If you have kids, you want them to gain an appreciation for food. Let them cook with you, absolutely! Essentials any aspiring chef or home cook should have in their kitchen? I think everyone should have a really great knife. Don’t chop vegetables with a little skinny steak knife that you took from your mom’s cabinet. Invest in a really good knife. You don’t have to get a two hundred dollar one. You can get a really good chef’s knife that will last you years and years with a little sharpening and care. Believe it or not, I love the salad spinner, and I use it to wash every kind of vegetable. An emersion blender too— it’s a cheap thing that you can use to make sauces and soups and salad dressing really fast without a problem. That’s awesome! And what can we look forward to on Vegan Mashup in the future? NEW YORK CITY’S CULINARY SCENE got a jolt of refreshing creativity last week. It came in the form of a two day preview of jay kitchen— the much-anticipated vegan fine dining restaurant concept from Chef Jay Astafa. Over the length of the sold-out popup, eight courses consisting of 650 platings of intricately-prepared dishes emerged from the kitchen of The Old Bowery Station on Manhattan’s Lower East Side. Highlights included the King Oyster Mushroom Scallop, which left diners awestruck; the Spring Crostini Duo— bursting with delicate flavors and textures; the Smoked Cauliflower Steak, which flawlessly united seven unexpected ingredients; the creamy House-Made Cheese Plate, with its precise balance of sweet and savory; the Grand Marnier Infused Chocolate Tart— practically a work of art. At the conclusion of the popup, Jay affably greeted each table of diners. The ability to remain cool and collected under tremendous pressure is challenging for even the most seasoned of chefs. It comes as a big surprise, then, that not only was this Jay’s first foray into an event of this scale, but that he is only 20 years old. “I’ve never done an eight course menu, so I really didn’t know what to expect,” he told us when we spoke to him recently. 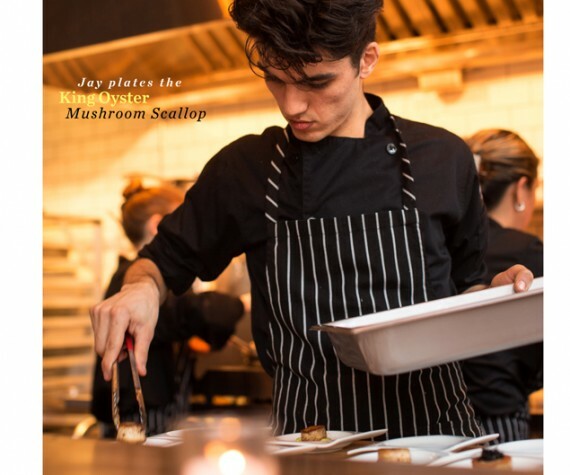 “That was more plates than I have ever plated and cooked during a dinner service.” The kitchen team consisted of just a handful of people— including Jay’s mother, and the popup’s talented pastry chef Dani McGrath, who has been collaborating with Jay since 2011. What sprung forth your vision for jay kitchen? I started developing a NYC vegan restaurant concept about a year and a half ago. For the past year I’ve been looking for locations but didn’t really have an exact detailed concept until now. My concept changed so much over the past year. Now jay kitchen is a chef driven vegan fine dining restaurant that focuses on modern technique and local and seasonal ingredients. I want a restaurant that can compete with the local foodie restaurants. I decided to do the popup version first, because I wanted to see if my concept would work in the fierce NYC dining scene. Everything went so smoothly during the popup, but was there anything crazy going on behind the scenes? The craziest and scariest thing was the ravioli course! Cooking over 250 raviolis a night on an electric hot plate was a difficult task. The water took forever to boil! The kitchen was all electric and didn’t have a professional gas stove. We cooked everything on induction hot plates. With a limited kitchen, my amazing kitchen team and I somehow managed to do it successfully. 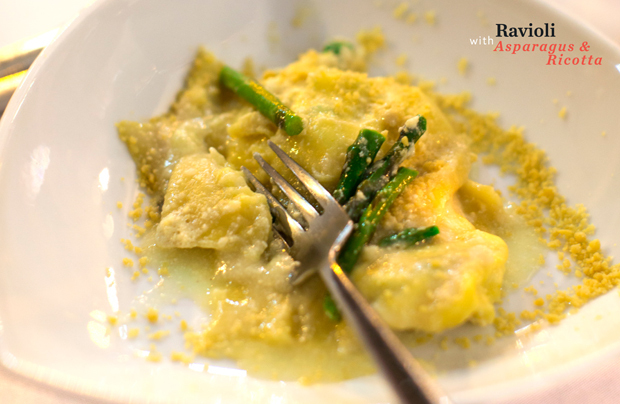 The ravioli course turned out to be everyone’s favorite. Putting the pea in the spotlight— a deliberate homage to those underrated, flavorful little gems? Vegetables are just so fun to work with. Most chefs just disregard vegetables and focus on meat, meat, and more meat. How boring and uninspired! It’s 2013, and vegetables are the new meat! When I was coming up with the menu for the popup, I wanted to give vegetables a chance to shine, something they don’t often do at restaurants. I used peas a lot, because they scream Spring! 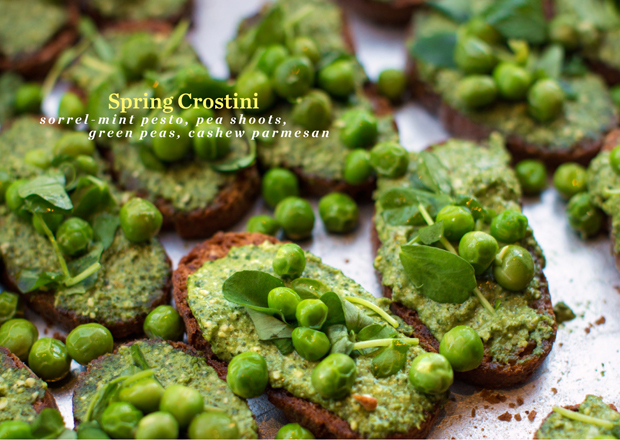 My favorite dish with them is the Crostini with Sorrel-Mint Pesto, Green Peas, and Cashew Parmesan— Spring in a few bites. And what was the development behind the Dragon’s Breath Popcorn— lengthy scientific trial and error, or a magical accident? 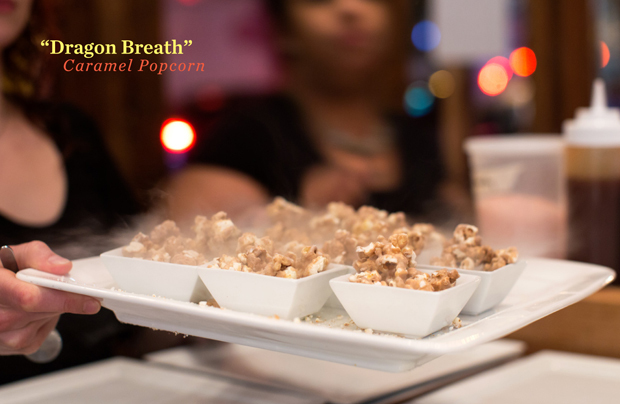 I had seen the technique in a video of a trendy modern restaurant, where guests would eat the popcorn dipped in liquid nitrogen and smoke would come out of their mouths. I just had to do this too, it worked perfectly with my (overall) concept. I also really wanted to work with liquid nitrogen! I like to make dining fun and an experience for people. It’s actually really simple to make, it’s all about the liquid nitrogen. You “fry” the popcorn in the liquid nitrogen and it gets frozen. You have to eat it really fast to get that fun smokey dragon breath! It really varies. I typically think of ingredients I want to focus on, and build a dish from there. I am always challenging myself to do things that I haven’t done before. 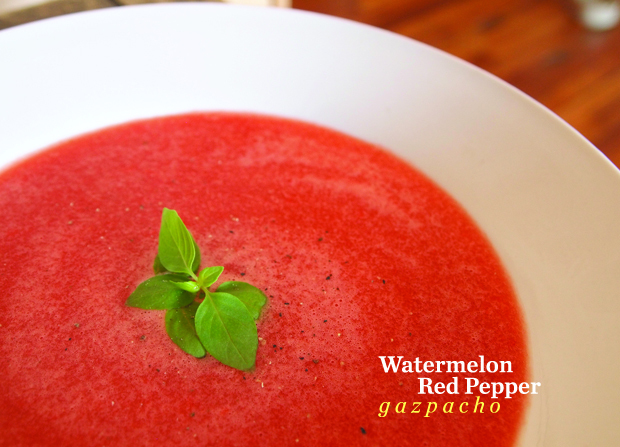 I love cooking in season, because everything is so fresh and delicious. I strive to create flavors that people don’t usually expect can be vegan. 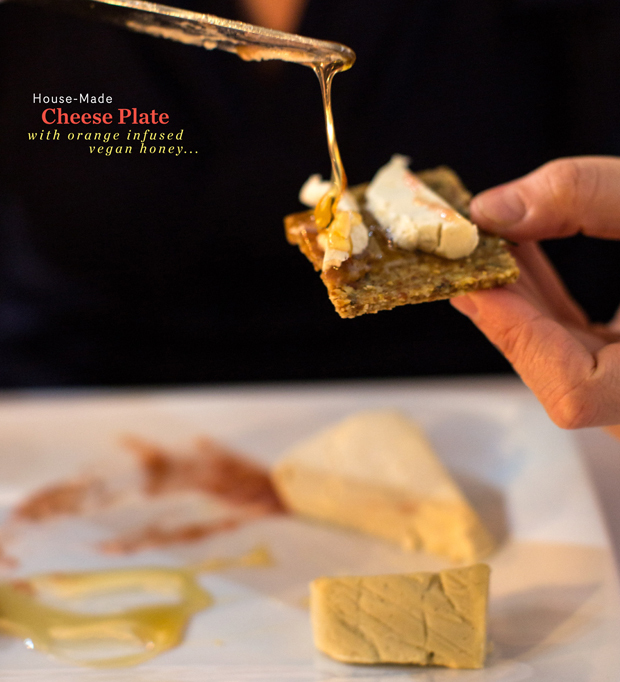 For the pop up menu, I made a lot of homemade vegan cheeses. I did it on purpose to show people that, yes, vegans can eat cheese too, and there is no excuse for dairy cheese. Also I really like taking vegetables and using them in a different way. An example are king oyster mushrooms, I transformed them into scallops and topped them with balsamic caviar. I’m inspired by modern techniques too, it’s something you don’t see at a lot at vegan restaurants. Michelin-starred chef you’d like to challenge to a vegan cook-off and why? I would say Gordon Ramsey! I watch all his shows, even though he doesn’t always say the nicest things about vegetarians. I would love to see what he comes up with. I don’t know if he has a Michelin star but I would really like to challenge Anthony Bourdain too. I want to show him what vegan fine dining is all about, and maybe he’ll change his view towards vegans! My inspiration is being vegan. I went vegan when I was 15, and it’s the best thing I ever did for myself, the animals, and the world. Going vegan inspired me to become a chef, and show people you don’t need to harm animals to create amazing food! I’m a voice for all those animals who can’t talk, no animal wants to be turned into your dinner. I’m so tired of seeing and hearing about restaurants that focus on animals products. It’s time for a change in the world! And finally, in honor of your age- 20, and your speed in the kitchen- tell us your food philosophy in 20 words or less! To create a fun gourmet dining experience that doesn’t harm animals and doesn’t sacrifice on flavor!